This is a BRAND NEW set of LEGO® Exclusives Employee Gift 4000007 Ole Kirk's House from 2012. This set is still factory sealed, however the box you receive may have one or more of the following conditions; small area of sticker damage, wrinkles, creases, dents and shelf wear. 910 pieces and no minifigures©. 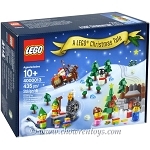 This is a BRAND NEW set of LEGO® Exclusives Employee Gift 4000013 A LEGO® Christmas Tale from 2013. This set is still factory sealed and the box is in very good condition with minor shelf wear. 435 pieces and no minifigures©.